It’s Christmas-time and whilst there may be much to celebrate, it’s also a time to reflect on our lives and think about the past year and how we might make changes for the New Year ahead. In today’s author guest post, Giles Hutchins presents his views on the matter. Arguably, we have lost our way, cutting ourselves adrift from our sense of place and purpose in the world. Cue the contagion of consumerism, the polarisation of politics and the ecocide of our environment. Woven into our scientific-philosophy and socio-economic thinking at deeply subconscious levels is a fundamental corruption, a flawed logic setting us apart from each other and Nature. Einstein spoke of this as an optical illusion of consciousness, which is now manifesting a devastating delusion. Large swathes of modern humanity are inured and institutionalised by the illusion of separation. It creates the belief that life is innately competitive, whilst evolution is a process of selfish ascendance. Breeding fear, polarisation and egotism, it creates carcinogenic behaviour hallmarked by a desperate desire for competition, consumption and ownership. Peter Drucker once said, ‘In times of turmoil, the danger lies not in the turmoil, but in facing it with yesterday’s logic.’ Frequently attempts to achieve well-intended solutions apply the very logic that created the problems. The new spirit of business, politics and socio-economics must be rooted in a new logic that transcends this illusion. By stimulating this new rationale, we liberate ourselves from the restrictions of the self-limiting mind-set that originally created the problems, enabling a shift to occur: from egotism to empathy; from separation to synchronicity; from power over to power with; from fear to courage. This shift enables new ways of leading, focusing on facilitating a learning environment where we can develop our capacity to become authentic co-creators within a life-affirming future. It simply requires our undivided attention and a deep love for life. Making space in our busy schedules to get out into Nature or retreat to a quiet place is a good start. Like the great minds of Einstein, Da Vinci, Pythagoras and Confucius, we too can allow ourselves to tune in to the inherent wisdom flowing throughout Nature. It’s time to activate this timeless wisdom today. In humanity’s hour of reckoning these times of breakdown can create the conditions for individual breakthrough. If we have courage. We are in the midst of a seismic paradigm shift, where the challenge of our time is to create space within our manic schedules for a real embodiment of the innate wisdom life affords us, thus increasing our awareness to the shift already afoot. Whether we’re activists or accountants, engineers or entrepreneurs, midwives or musicians, these transformational times demand we trigger this consciousness now. 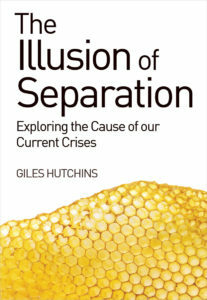 The Illusion of Separation is available to buy here. Watch a 3min video about The Illusion of Separation see here. For a longer 10min talk see here. Have you read “The wholeness of Nature”, also published by Floris books? It has an important contribution to make on this theme.